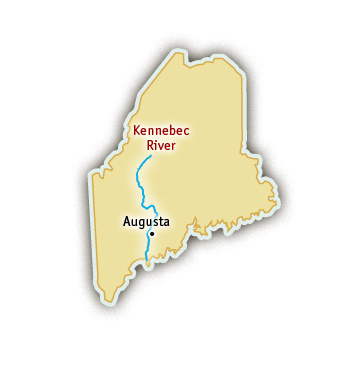 Kennebec River rafting is famous for its remote wilderness setting, big roller coaster waves and summer-long flows. The source of the Kennebec River is Moosehead Lake, Maine’s largest inland body of water. Rafting.com is currently seeking qualified outfitters for Featured Listings. If you are a local rafting outfitter in Maine and would like to see your company listed here, please contact us for more information. The Kennebec River is a high-volume river with great Class IV whitewater. It carves its way through a deep gorge for the first four miles of advanced whitewater. Some of the more well known and difficult Class IV rapids on the Kennebec are Rock Garden, Three Sisters, the Alleyway, and the Class V Magic Falls. Scouting the upper section is virtually impossible because of the sheer walls of the Gorge, and the remoteness of the river. As you exit the steep gorge the river spreads out creating the opportunity for wildlife viewing. It is not uncommon to see deer, river otters, and eagles if you are not too distracted by the whitewater. You may also find runs of Atlantic Salmon and native Sea Lampreys. The dam-controlled Kennebec River has normal water releases of 5,000 cfs from early May to early October.